Please note that to be considered for admission, prospective students must complete the Grad Rebel Gateway application, provide the Graduate College with all required documents, and also provide your graduate program of interest with all the application materials that they require. Generally you can submit both materials required by the Graduate College and materials required by your intended program together into your online application; doing so will expedite your application processing. Graduate certificate-seeking and non-degree-seeking students are not eligible for an I-20/student visa, a graduate assistantship, or federal financial aid. While each graduate program has unique admissions standards, the Graduate College maintains minimum standards for graduate admission. All advanced degree and certificate program applicants must meet these eligibility requirements to be considered for admission. Bachelor’s Degree – You must hold a four-year baccalaureate degree from a regionally accredited institution, or an approved international equivalent. Grade Point Average – You must have a minimum overall grade point average of 2.75 (4.00=A) for your bachelor’s degree, or a minimum 3.00 (4.00=A) for the last two years (60 semester hours). Additional Requirements – Factors that may also be considered by the academic department to which you are applying include test scores (like the GRE or GMAT), the type of course work completed during undergraduate studies, letters of recommendation, writing samples or portfolios, and any other supporting documents your department/program may ask you to submit to complete your application. International Applicants: Proof of English Proficiency – The application process for international students is the same as for domestic students, with the exception of submitting proof of English Proficiency. Transcripts – All applicants are required to submit a transcript from each postsecondary institution attended, showing all degrees and coursework, the dates awarded, and grades received. If the institution is outside the U.S., a foreign credential evaluation may be required. Please review our foreign credential evaluations page for additional guidelines, information, and requirements. Credentials not in English must be accompanied by an English translation certified as true by a university official, an official representative of a United States embassy or consulate, the United States Information Service, the United States Education Foundation, or an approved professional translating service. Notarized copies of originals or translations are not considered official. Credentials from China: Students who have completed a degree in China must provide copies of the original language transcripts and a copy of their Degree Certificate and Graduation Certificate. Documents verified by the China Higher Education Student Information and Career Center (CHESICC) or the China Academic Degree and Graduate information Center (CDGDC) are also accepted. Credentials from India: Consolidated marks sheets are acceptable if yearly mark sheets are not available. Mark sheets must also be issued by the degree-granting institution. Mark sheets from affiliated colleges, are not acceptable or considered official. Students who have completed a degree in India must also provide a copy of their Provisional Certificate. Please note that the aforementioned requirements are the minimum requirements established and monitored by the Graduate College. Meeting the minimum admissions requirements is a necessary but not sufficient condition of admission. Admission decisions are based on applicants meeting the minimum Graduate College requirements and a more extensive and holistic departmental review, which considers a combination of factors, including indicators of success based upon academic degrees and records, the statement of purpose, letters of recommendation, test scores, relevant work experience, and the like. All application materials must be submitted to the Graduate College by May 1 for the fall semester or Oct. 1 for spring semester unless the department to which you are applying has an earlier deadline. Note that Graduate Assistantship application deadlines may also be earlier. Please review the application deadlines. 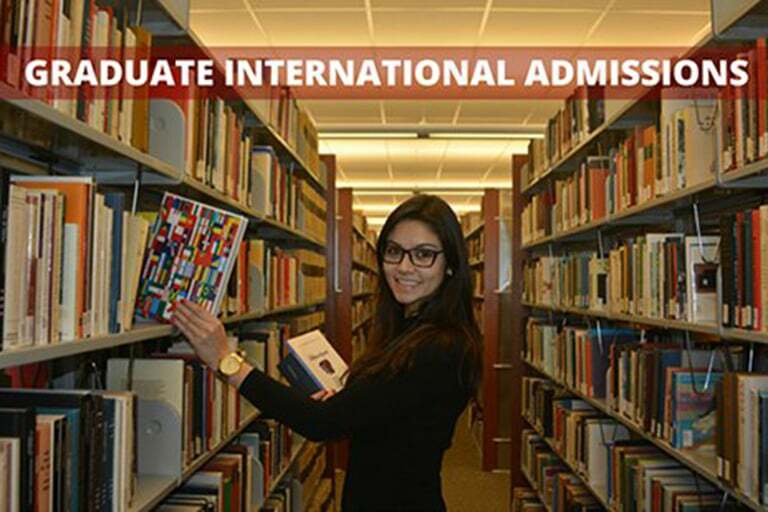 International applicants must also meet immigration/visa-related deadlines and must receive their admissions letter from the Graduate College by July 1 for the fall semester and by Nov. 15 for the spring semester. For more information about immigration/visa-related deadlines, contact internationalgrad@unlv.edu. International graduate applications for admission are simultaneously reviewed by the Graduate College and your graduate program faculty. During the evaluation process, the Graduate College will process your online application, certify your transcripts and GPA, review your proof of English proficiency, and ensure that you meet UNLV’s minimum requirements for graduate admission. Your academic department will review all materials and submit their recommendation to the Graduate College; your final, official decision letter will be posted to your online application account by the Graduate College. To expedite the admissions process, it’s important that you submit a complete application and upload all required materials and documents. Turn to the Graduate Catalog to learn more. Review Admission Requirements – Review requirements for advanced degree and certificate program applicants. Be sure to check your department of interest as well because departmental requirements vary. Please note that only degree-seeking students are eligible for I-20/student visas and graduate assistantships. Certificate programs are not considered degree-seeking. However, with proper approval students may be enrolled concurrently in both degree and certificate programs. A completed application. Complete the application online. A nonrefundable admission application fee of $95, payable online by credit card or by check/money order, to the Board of Regents, UNLV. *Note: Applications and materials will not be processed until the application fee is received. Applicants to any UNLV graduate program must pay the admission application evaluation fee for each application filed. Denied applicants, who later seek admission to the same or other UNLV degree program, are required to pay an additional application fee. Additional Materials for your Department & Degree Program Application – Submit any additional department-required admission materials by uploading them into your online application. Please check with your graduate program of interest and refer to the application checklist on the Home tab of your Grad Rebel Gateway account in order to determine their specific admission requirements prior to submitting your online application. Financial Certification Requirement – Submit Financial Certification form and Bank Letter to the Graduate College. Before an I-20 can be issued, all international students must submit a completed Financial Certification form and bank letter. Even if you anticipate receiving a Graduate Assistantship, you must submit the Financial Certification form and bank letter. Use this helpful checklist to prepare for your first day of class. Please refer to these helpful answers if you have any questions.